On this weeks show we have an open discussion with different business sectors. We discuss Relationology, Crowdfunding and Sport Psychology. 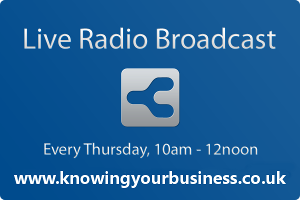 Knowing Your Business interview Matt Bird, Maggie Langley and Gary Diplock to find out more. Matt Bird explains what relationogly is all about. Matt Bird helps leaders and organisations build the relationships they need to achieve greater success. He has created Relationology about the art and science of relationships and how they drive life significance and business success. Matt is an international keynote speaker and leadership development consultant who inspires people to believe they can and imparts insights to enable them to succeed. His programmes are renowned for creating lasting change. He is a specialist in new business development and client relationship management. His clients have included: PwC, KPMG, Charles Russell, Manches, Lloyds Banking Group, BHP Billiton, Oxfam and Metropolitan Police. Maggie Langley from Crowdpatch gives us insights into crowdfunding. The founders of CrowdPatch, Simon Krystman and Richard Kipling are experienced businessman with an interest in how digital communications can bring local communities together. They see crowdfunding as an innovative way for crowds of people to work together to make a difference. Their site groups people with shared interests together in online Patches where they can communicate using their social networking features or support projects they care about by making a crowdfunding donation. Gary Diplock expains Sports Psychology. Gary travels throughout the UK, to gain knowledge of the latest techniques and to meet clients competing in many different sports, from Professional to Amateur, all ages and abilities, able bodied and disabled. As a Member of the Association for NLP and an affiliate Member of BASES (the British Association of Sports and Exercise Sciences), Gary has access to the latest sporting psychology information and research. Julie Cooper gives us a back story of her book Face to Face in the Workplace and what the future holds. Meet Julie Cooper, author of ‘Face to Face in the workplace’, and our guest on this week’s podcast. With 20 years’ experience training managers to get the best out of their teams, both for better productivity and for a happier workplace, Julie discusses how to handle those delicate conversations with Ian and Darren. With some straightforward steps you can apply in your place of work, this half hour listen could make your working day better tomorrow and every day. Click now to listen. She understands that busy people need accessible, practical information, which is why her books are packed with instantly usable techniques and tips. She also coaches other professionals to help them turn their ideas into a book. You can find her books at Amazon or at www.springpublishing.co.uk from the beginning of December.